Image of James Watts (left) and Jack Winer with the winner's cheque, picture by courtesy of Adrian Milledge. 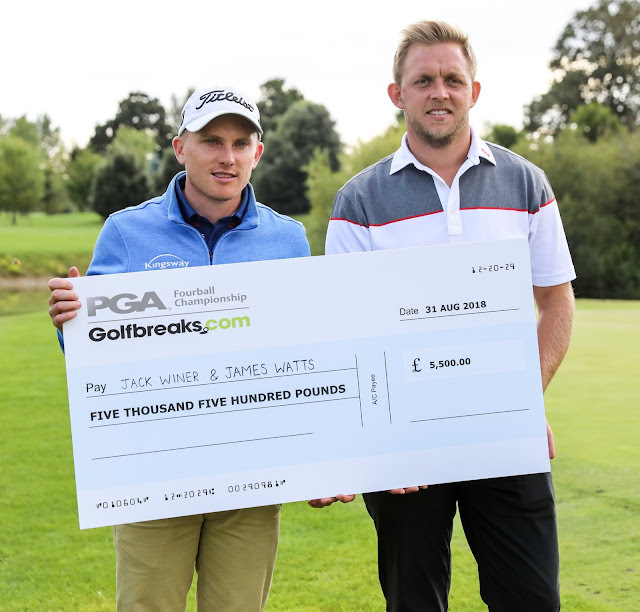 But having led the chase for the £5,500 winner’s cheque since posting an opening 12-under-par round of 60, they were given an almighty scare confirming it while negotiating the tournament’s closing holes. Then Keogh, chipping from the fringe behind the hole, came within an inch of one before Winer, on the green in two, held his nerve to hole from 14 foot to secure victory. “He was my best man in April and I’m best man at his wedding in June,” said Watts.“We’ve been friends for a long time so it’s nice to come out and do the business together,’ added his partner. 27 under par Jack Winer (Abridge Golf and Country Club) and James Watts (Kingsway Golf Centre)*, Adam Keogh (Spalding Golf Club) and Michael Reed (Glen Gorse Golf Club). Winer and Watts won play-off.